Cancellara unsurprisingly set the best early time with a 57:15. First to top his time was Saxo Bank's Australian Richie Porte, taking the lead with his 57:03. Edvald Boasson Hagen and Vacansoleil's Thomas de Gendt both flirted with the stage lead at their intermediate time checks, with Boasson Hagen setting the best time at Time Check 1, and de Gendt hitting Time Check 2 24 seconds faster than Cancellara. Saxo Bank's Richie Porte came through in 57:03 to take the stage lead. De Gendt finished in 57:02, taking the stage lead. Tony Martin, who won an identical stage at the Criterium du Dauphiné Libéré in June, set the new best time at Time Check 1 in 20:12, :22 faster than Boasson Hagen. Boasson Hagen broke an aerobar extension, and finished in 57:43, 4th at that point. Tony Martin looks like he could repeat his Criterium du Dauphiné victory, hitting Time Check 2 in 40:26, 37 seconds faster than anyone else so far, and Time Check 3 in 49:53, more than a minute faster than any other rider so far. At the finish, it's Martin in 55:33 taking the lead of the stage. When the GC men took the course, it didn't take long to see that Cadel Evans was putting a serious hurt on the times of both Schleck brothers. At the first time check, Evans and Contador were even, :21 behind Martin, :34 ahead of Frank Schleck and :36 ahead of Andy Schleck. At TC2, Contador faded, but Evans closed on Martin's time with a 40:33, just :07 behind HTC's German. GPS put Evans into the virtual lead of the race, with his lead growing steadily. The Schlecks hit TC2 more than 1:40 down on Evans. By the third time check, it was clear all Evans had to do was stay upright to the finish to take the yellow jersey and very likely the overall Tour victory. The big question was whether his scorching time would be enough to bring him the stage win, as well. At the finish, Evans clocked a 55:40, seven seconds off Martin's stage-winning time. When the Schlecks finally arrived, they clocked almost identical times, in 58:14 for Frank and 58:12 for Andy. Pierre Rolland held a 1:36 lead over Estonian time trial champion Rein Taaramae in the white jersey competition, but ceded just :48 on the day to hold the jersey, and a place on the final podium for himself and his Europcar team. As so often happens, the Tour will be decided in today's final time trial. It's a 42.5 km course, with the start and finish in Grenoble. It's not pancake flat, with the high and low points of the course differing by almost 400 meters in altitude. It's on the hilly side of rolling. There are two primary hills on the course, and time checks are in Vizille, after the first descent, and Saint Martin d'Uriage near the top of the second hill and before the 15-kilometer descent to the finish. The exact same course was used in the 2011 Criterium du Dauphiné Libéré in June. There, it was won by Tony Martin, followed by Brad Wiggins, Edvald Boasson-Hagen, and Dave Zabriskie, with Cadel Evans in 6th, 1:20 behind the leader. Both Andy and Fränk Schleck used the Tour de Suisse instead of the Criterium du Dauphiné in their preparation, so we don't have a direct comparison of their times. When Cadel Evans and Andy Schleck have gone head-to-head in Tour time trials, Evans has won every time but one, last year's final TT when Evans, riding with a broken arm, finished more than 10 minutes off Fabian Cancellara's winning time. In that TT, Andy Schleck beat Evans by 4:41. In every other Tour TT they have both raced, Evans has beaten Andy by at least :30: 2008 Stage 4, it was 1:02; 2008 Stage 20, it was 2:00; 2009 Stage 1, it was :37; 2009 Stage 18, it was :34; and in the 2010 Prologue, it was :30. Today, Schleck starts with :57 on Evans (and Fränk Schleck sits in the middle with just :04 advantage to Evans). I never pick against Fabian Cancellara in a time trial. Tony Martin's obviously another favorite, having already won on the same course. Stage 13 started fast, with five or six atttempts to make a breakaway all being chased down and the field averaging around 50 km/hr or 31 mph. The high pace put Andreas Klöden in trouble off the back of the peloton. Klöden is still suffering from injuries to his lower back suffered in a crash in Stage 9, and with about 40k ridden, Klöden abandoned the Tour, barely able to climb off his bike, or to stand up once he was helped off. His abandon leaves just 5 Radio Shack riders in the Tour. Also put in trouble early was Rabobank's Lars Boom who trailed the field by more than 3:00 on the first climb of the day, the 3rd Category Côte de Cuqueron. Yesterday's 2nd-place finisher, Jelle Vanendert, led the peloton over the climb, with occasional attacks still trying and failing to get clear of the field. With more than 50k ridden, a breakaway group was finally successful, and had more than 1:00 in hand after 60k. In the group were Thor Hushovd, Jerome Pineau, Martin Tjallingi, Dmitri Fofonov, Edvald Boasson Hagen, Alessandro Petacchi, Lars Bak, Vladimir Gusev, David Moncoutie, and Jeremy Roy. With these 10 away, the pace in the field finally dropped a bit, and the gap quickly pushed out toward 2:00. Lars Boom and Vladimir Isaichev, both gapped way before the Tourmalet, abandoned the race on the road. Gap went out beyond 4:00 as the field worked the climb. For the intermediate sprint, Hushovd and Petacchi were expected to go for max green jersey points, but the group pretty much just pacelined through the sprint line. In the field, Philippe Gilbert launched an attack from way too far to the line, then was easily swamped by Rojas and Cavendish and their teammates. At the line, Rojas nipped Cavendish, who gestured angrily, but didn't appear to be impeded in any way. Soon after the leading 10 hit the Col d'Aubisque, the group was shredded by an attack by World Champion Thor Hushovd. Hushovd may have had visions of his 2009 Stage 17 spent in a long solo break, but he was quickly joined by Jeremy Roy of FDJ, with David Moncoutie and Edvald Boasson Hagen close behind, and the other break survivors fading away. Hushovd's lead on the field stretched out over 6:30, while Delage, Mollema and Gadret counterattacked off the front of the field. With a little more than 50k to race, gravity returned to normal, and Roy, then Moncoutie were able to come around Hushovd. Edvald Boasson Hagen initially had followed Moncoutie, but never made the bridge to Hushovd. Atop the Aubisque, Roy held his lead of about :50 on Moncoutie, and coupled with his points from the Tourmalet yesterday, Roy will take the King of the Mountains jersey if he finishes the stage. Moncoutie began the descent :50 down on Roy, with Hushovd chasing more than a minute behind Moncoutie. Hushovd reeled in Moncoutie on the descent. On the uncategorized climb of the Soulor, Roy saw his lead on the pair at 1:27, but over the last 25 kilometers of the stage, Hushovd did most of the work to close on Roy. At 20k, the gap was 1:10, but over the next 4 km, Hushovd cut that lead in half. In the next 4 km, he cut it in half again, leaving Roy a bare :20 in front with 12 km to the line. Roy fought valiantly, but the Norwegian world champion chipped away at his lead, until inside of 3 kilometers to the finish, Hushovd used a small hill to thunder away from Moncoutie, catching and riding straight past Roy. Hushovd rode alone to the finish for his 8th career stage win. Moncoutie also passed a dejected Roy to take 2nd on the stage. Stage 13 sets up as a bit of a palate-cleanser for the GC riders, fresh from the first big all-you-can-eat hurt buffet of the Tour. The major feature of the stage is the Col d'Aubisque, an hors categorie climb that could put some of the GC pretenders to shame. The summit comes with 35 kilometers to the finish, so there will be ample opportunity for a regrouping on the descent to Lourdes. Two other categorized climbs are on tap: the 3rd Category Côte de Cuqueron at 42.5 km is short and steep, and could be a spot for a breakaway, and the 4th Category Côte de Belair, which comes at the end of about 8.5k of rising road, even though the official climb is just 1 km. The intermediate sprint comes between the two lower category climbs and Col d'Aubisque, at 82.5 kms. This is one of the stages where Philippe Gilbert might be able to make up green jersey points on Mark Cavendish, either through Cavendish falling off the back on the big climb, or through Gilbert making a break on the long descent. It's doubtful the course will rip the yellow jersey from Thomas Voeckler's shoulders; that's more likely tomorrow as the race heads up to Plateau de Beille. Arnold Jeannesson of FDJ wears the white jersey, Sammy Sanchez the polka-dots, and Cavendish the green jersey for Stage 13. Stage winner is likely to be somebody like Stage 12 winner Sammy Sanchez or French champion Sylvain Chavanel, a strong rider well back in the GC who can get in a break over the Aubisque and help it stay away from the chasing field all the way down to Lourdes. Today the focus shifts from sprints to a marathon, as the Tour de France comes to the Pyrenees. Stage 12 is 211 kilometers/131 miles, with 3 climbs ranked at least 1st Category. The majority of today's stage is comparatively flat, with the first real climb more than 130 kilometers from the start. First up is the 1st Category Col de Horquette d'Ancizan, making its Tour de France debut, followed by the HC Col du Tourmalet, then the HC Luz Ardiden for the finish. Johnny Hoogerland's time in the King of the Mountains jersey is almost certainly over today as the points on offer dwarf those awarded so far.Thomas Voeckler has said he thinks he's likely to lose the leader's yellow jersey today, as well, but has promised to battle to keep it. Luis-Leon Sanchez, sitting 1:49 down on Voeckler but :37 ahead of Evans, could inherit yellow. Mark Cavendish rides today in the green jersey. The intermediate sprint line comes at 119km, before the stage hits the Pyrenees, so Cavendish, Gilbert, and Rojas should all be able to contest it. Today is Bastille Day, the French national holiday, which usually means French riders killing themselves in the breakaway in an effort that ultimately comes to naught. Expect that pattern to continue as the poorly placed GC hopefuls (Alberto Contador and Sammy Sanchez) are going to need to go all out to crack the field, while the well-placed GC riders like Evans and the Schlecks will have to play defense, keeping those threats under control. It's really anybody's guess who has the best climbing legs in the Tour this year, but we're going to get our first look today. Lots of commentators believe Ivan Basso of Liquigas has been keeping a low profile awaiting the big mountains and tipping him for a possible stage win here. I typically watch Tour stages with one display on Versus, and a second showing the English-language video stream they provide, with commentary by Matt Keenan, then Phil and Paul once the on-air broadcast is underway. I have paid for the Flash-based video stream to my Mac, but last year, I used the Versus iPhone app on my iPhone and iPad (using the iPhone app double-sized) to track the race during broadcast commercials or when I was away from a TV. This year's app is much better, with far more video, at least a dozen good quality photos per stage, full iPad support, and fewer crashes. In one way it was worse, however. 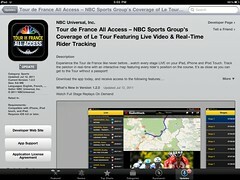 Last year's app allowed (and still allows, if you've got the 2010 Tour app installed) you to go back and watch the full video of the stage, while this year's offered only highlights (typically, crashes and finishes) once the live video was done. Until today, that is. There's a new version 1.2.0 of the iOS app that allows subscribers to go back and watch previous Tour stages in their entirety. For now, the full stream goes back to Stage 6, but it's promised that previous stages will be available soon. It's done through a browser window, launched by the app, and allows you to scrub through the video to look for your particular highlight. Stage 6 and Stage 8 have about 3:20 of video, Stage 7 and Stage 9 around 4:15. As I write this at 7:25 Eastern on Tuesday, Stage 10 hasn't yet appeared. Video quality may be a bit lower than the initial stream -- I'm not in a position to test it with a good quality broadband connection right now. This is the shortest stage of the 2011 Tour at 158 kilometers/98.2 miles. The profile looks a little easier than Stage 9, with four categorized climbs, alternating 3rd-4th-3rd and 4th category. The last climb of the day comes with about 15k left after a 20-kilometer downhill, and could possibly be a springboard for an attack to the line. More likely, though, we'll see the breakaways kept under control. With Thomas Voeckler in yellow, Europcar will check any move that would threaten his lead, and HTC and Garmin (heck, maybe even Movistar for Rojas) will likely work to set up a sprint finish. There are just 4 more stages that look to favor the sprinters: today, tomorrow's Stage 11, Stage 15 on Sunday and the final stage into Paris on the Champs-Élysées. Make me choose a winner for today, and I've gotta go with Cavendish. The intermediate sprint is only 37 downhill kilometers into the race, so we'll likely see it contested by all the riders with an interest in the green jersey: Gilbert, Rojas, and Cavendish included. If Vacansoleil's Johnny Hoogerland can ride after his horrific Stage 9 injuries, he should hold the King of the Mountains jersey through the day; he's up by 6 points on Voeckler with only 6 points available to any one rider today. Stage 9 looked like one for the break, but no one could predict just how many breaks we would see. Juan Mañuel Garate of Rabobank didn't make the start, leaving 188 riders active. Early in the stage, there were three more abandons: Pavel Brutt of Katusha, Wouter Poels of Vacansoleil, and Amets Txurruka of Euskaltel-Euskadi. Veteran escape artists Thomas Voeckler of Europcar, Luis Leon Sanchez of Rabobank, Juan Antonio Flecha of Sky and Sandy Casar of FDJ broke away with Vacansoleil's Johnny Hoogerland. All but Hoogerland are past stage winners, while Hoogerland, in his first Tour, was apparently in search of the King of the Mountains jersey, where he started the stage a point behind Tejay Van Garderen. They were initially joined by Quick Step's Nicki Terpstra, who faded back to the field when the group found the mountains. Hoogerland would take maximum points over most of the day's climbs, with Voeckler, best placed of the breakaway, looking to finally take the yellow jersey from Garmin-Cervelo's Thor Hushovd, who had held it since the team time trial last Sunday. There were a few minor falls early in the stage, including one by defending champ Alberto Contador that looked like he had had been body-checked off the course Katusha's Vladimir Karpets. After the stage, Contador and Karpets agreed that Contador had caught his brake hood on Karpets' seat. On the descent from the Puy Mary, the field carried too much speed into too little corner, and a number of riders went down. Astana's leader Alexandre Vinokourov tumbled down an embankement into some trees, and was helped back to the roadside by his teammates. Omega Pharma's GC hopeful, Jurgen van den Broeck, his teammate Frederik Willems, and Garmin-Cervelo's Dave Zabriskie were alll down in the same crash, and all would have to abandon the race. Zabriskie apparently fractured his hand, van den Broeck his shoulder blade, and initial reports were that Vinokourov had fractured his pelvis and femur, ending the Tour he had said would be his last. Caught in the crash but continuing were Christian Vande Velde and David Millar of Garmin-Cervelo and RadioShack GC hopeful Andreas Klöden, who went to the hospital for X-rays after the stage. Klöden was heavily bruised on his back, but X-rays showed no breaks. At the front of the pack, Cancellara and Gilbert neutralized the chase, allowing many of the downed riders to rejoin but also giving new life to the breakaway, which saw its lead balloon from around 4:00 to nearly 8:00 before the field could reorganize. With around 43k to race, a television car tried to pass the lead group, cut back to avoid a tree, and took out Flecha and Hoogerland. Hoogerland was propelled off the road, into the air, and onto a barbed wire fence. After medical attention, and needing only to reach the finish line to take the King of the Mountains jersey, Hoogerland mounted up and rode, bleeding heavily from his left leg. Voeckler, Casar, and Sanchez considered waiting for Flecha, but finally had to continue as a trio, with Hoogerland, then Flecha being reabsorbed by the peloton and finishing with the laughing group, which was undoubtedly dire today. The day's intermediate sprint came with only about 30 kilometers to ride, and Philippe Gilbert led the field in to hold the green jersey and widen his lead on Cavendish, Rojas and Hushovd. Garmin-Cervelo rode to limit Voeckler's gains until about 12k to the line, then handed the job over to BMC, then LeopardTrek. Voeckler, who spent 10 days in yellow back in 2004, was clearly burying himself for a chance to repeat the experience. In the last kilometer, Voeckler tried to lose his passengers, but Luis Leon Sanchez was waiting for the move and easily distanced Voeckler, with Casar unable to even respond, to take the third Tour stage victory of his career. Voeckler would take yellow with a 1:49 advantage on Sanchez and 2:26 on Cadel Evans. Philippe Gilbert would again lead in the field sprint, in a group with Evans, both Schlecks, Martin and Velits of HTC, Cunego, Contador, Danielson and Sanchez (among others) at 3:59 and Leipheimer, Gesink, Thomas, Basso, and Klöden (among others) at 4:07 down on Voeckler. 6) Cadel Evans, BMC, s.t. 7) Andy Schleck, Leopard Trek, s.t. 8) Tony Martin, HTC-Highroad, s.t. 9) Frank Schleck, Leopard Trek, s.t. 10) Damiano Cunego, Lampre, s.t. From the Tour's longest stage on Thusday to the flattest on Friday, Stage 7 ends in Chateauroux, where HTC sprinter Mark Cavendish took his first stage win back in 2008. If Cavendish really wants to take 5-7 stages of this year's Tour, as he said before the race, he's going to need today's stage. A win here would also be a big help for Cav in the green jersey competition before the race moves into the mountains, where Philippe Gilbert and Thor Hushovd are likely to find opportunities to collect points while Cavendish rides in the grupetto. It's a stage with no real features to speak of. Johnny Hoogerland will hold the KoM jersey for another day if he can make the finish, with no mountains points on offer. The sprint configuration is interesting, with the "intermediate" sprint coming with 192.5 km ridden, just 25 k/15.5 miles from the finish. Will HTC let a breakaway stay away through the intermediate sprint, or contest two sprints in 16 miles? Cavendish is the favorite, with Farrar, Galimzyanov, or Feillu possible alternates if HTC misfires. Edvald Boasson Hagen won Stage 6 of the Tour on Thursday, holding off yellow jersey Thor Hushovd and Stage 1 winner Philippe Gilbert in the closing meters to take his first Tour stage and the first for his Team Sky. The day's finish profile discouraged Cavendish, Farrar, and their ilk, favoring the torquier sprinters. With 1k to ride, Garmin-Cervelo's David Millar led the way, with Gilbert, Evans, and Hushovd close behind, and HTC trying to set up a leadout on the right of the pack, with Matthew Goss in its sweet spot. Astana's Alexandre Vinokourov tried to escape, but was countered by Rabobank's Bauke Mollema. With a few hundred meters to ride, Boasson Hagen launched off the wheel of teammate Geraint Thomas, outkicking Hushovd and Gilbert, stacked up behind him. At the line, in fact, it was Matthew Goss, closing fast, who would take 2nd on the stage, with Hushovd third. Radio Shack's Levi Leipheimer suffered the only significant change in overall placing by a GC hopeful, limping in 1:05 back after falling on wet pavement late in the stage. The break of the day at least factored in the jersey competitions, with Johnny Hoogerland of Vacansoleil taking 3 King of the Mountain points to take over the jersey through Saturday, at least. Also in the break were Leonardo Duque, Anthony Roux, Lieuwe Westra, and Adriano Malori. The break surrendered bit by bit, with Malori holding out to about the 15k mark, and earning the most aggressive award for the day. HTC's Mark Cavendish came out to play at the intermediate sprint behind the breakaway, easily taking 6th ahead of José Rojas, who was looking to get back into the green jersey after a nullification of points in Stage 5. Cavendish complained after this year's course was unveiled that organizers included stages like today's to limit his opportunities for victory. That may be, but I would rather see a battle like today's than the HTC train catapulting Cavendish to a 5-bike-length victory, an all-too-common sight the last few Tours. Tomorrow, look for the HTC train to catapult Cavendish to victory, as Stage 7 is the flattest of the Tour. Today's the Tour's longest stage, with riders making their way into Normandy. Prevailing winds are expected to be from the west, making today's stage a fast one. We've got three categorized climbs on the day, two 3rd Category at 99.5km/62 miles and 156.5km/97 miles and a 4th Category at 197km/132 miles ridden. With a maximum of 5 pts on offer over the 3 climbs, it's likely a rider in a long breakaway might take over the polka-dot jersey from Cadel Evans, currently leading the competition with 2 pts. The intermediate sprint is in Vassy at 131 kms/82 miles ridden. Philippe Gilbert leads the category after José Rojas had his points from yesterday's intermediate sprint nullified. With Gilbert showing interest in the green jersey competition, today is another day where he might be able to gain points on Cavendish, with the finish profile (below) featuring a healthy climb from 3k down to 1k to the line that might take a bite out of the pure sprinters' legs, tilting things to Gilbert or Hushovd. We might also see a gap in the field at the finish, so the GC hopefuls will have to be attentive to these last few kilometers. Over at The Inner Ring, they're discussing whether Cavendish is the greatest sprinter of all time. He's certainly the greatest Tour sprinter of our time. In the time I've been following the Tour (since the late '80s), there's never been a sprinter so dominant in the Tour over 3+ seasons. Petacchi won 4 stages in 2003, then went 7 years before taking a pair last year. Cipollini won stages every year from 1995-99, and 4 in 1999, but wasn't invited from 2000-2003, so he ended his career with 12 Tour stage wins. Boonen has won 2 stages in three different Tours. McEwen won two or three stages in each of 2002, 2004, 2005, and 2006 (12 in total), but he was shut out in 2003. The sprinter who came nearest to matching Cav's Tour record in recent memory was probably Tom Steels, who won 9 stages in three Tours from 1998-2000. In Cav's last three complete Tours, he's won FIFTEEN. And as he showed today, he blends Petacchi's finishing speed with McEwen's positional savvy. In the days Before Cavendish, picking a sprint stage was about throwing a dart at which of the guys with a good finishing kick would be on a good day or get a great leadout. Given 4 choices, you would probably hit one or two podium spots. Today, if it's a sprinter's stage, you're crazy to pick against Cavendish. That's how dominant he has been. Nobody was counting Mark Cavendish out of this Tour, except in Cav's imagination. But the well-oiled HTC-Highroad machine has sputtered at a couple of key junctures so far, and Cavendish has been unable to seal the deal. Wednesday, the wheels again came off HTC-Highroad's leadout, but Cavendish wouldn't be denied, streaking easily through the competition to take his first win of the 2011 Tour. The longest breakaway of the day featured José Ivan Gutierrez, Anthony Delaplace, Tristan Valentin and Sébastien Turgot, who escaped just after the racing began and were caught with about 45 kilometers to race. It was a nervous day in the field, with crosswinds threatening echelons that never quite formed, and narrow roads that wouldn't qualify as driveways in some parts of the United States. The result was dozens of crashes. Radio Shack's Janez Brajkovic suffered a concussion and broken collarbone and abandoned the Tour after he was caught up in a crash that also injured Rabobank leader Robert Gesink. Sky's Bradley Wiggins and Quick Step's French road champion Sylvain Chavanel also spent time in the horizontal plane. Defending champion Alberto Contador was down in two separate incidents, while Saxo Bank teammate Nicki Sørensen found his bike wedged against a photo motorcycle trying to edge past on a very narrow road. Sørensen flipped to the ground then slid to a stop in the roadside. At the day's intermediate sprint, green jersey José Rojas and Tom Boonen got caught up and swept almost from edge to edge, leading Cavendish to gesture at what he thought was a flagrant foul. The pair were stripped of points earned in that sprint after the stage, dropping Rojas out of the green jersey lead (now led by Philippe Gilbert). Boonen would also hit the deck quite hard and spent the rest of the stage fighting just to try to get in under the time limit for the stage. The early capture opened the door for a pair of French opportunists, FDJ's Jeremy Roy and Europcar's Thomas Voeckler, who escaped with 32k to ride and yo-yo'ed off the front until less than 3k to ride. HTC-Highroad throttled up its train, but the cars got scrambled late as Sky's Edvald Boasson Hagen tried to escape. Separated from usual leadout man Mark Renshaw, Cavendish found the wheel of Geraint Thomas, then Philippe Gilbert and shot through the leaders in the final 200 meters to take the stage. The stage had little impact on the overall race lead, but tossed the green a bit, with Gilbert inheriting the leader's jersey only late in the afternoon when Rojas was docked for the squirrely intermediate sprint, and Cavendish moving up to 4th overall. I'm working on an updated survey of all the Tour Twitterers worth following, but I wanted to give a nod to five who have already really added to my enjoyment of this year's Tour. The focus of today's stage will be HTC-Highroad's Mark Cavendish. Winner of 15 sprint stages of the Tour in the past three years, Cavendish missed out in Stage 3, this year's first pure sprint, and finds himself more than 30 points behind some of his expected rivals in the green jersey hunt. Garmin's Jonathan Vaughters still says the green jersey isn't a team goal, but Tyler Farrar suggested yesterday he's in that contest, taking an intermediate field sprint ahead of Cavendish when it looked like Cavendish was perfectly set up for the points. Today's intermediate sprint is at Goudelin, 70k/43.5 miles into the stage, and could be worth as much as 20 points if the field were together at that point. The finish at Cap Fréhel will be worth 45 points. Smart money is on Mark Cavendish for the win, with Tyler Farrar, José Rojas, or Romain Feillu in with a shot. Wind will likely play a role in the field. We could see contenders caught behind a field split, or riders hitting the deck as teams try to avoid one. We'll have just a single 1-pt 4th Category climb, 45.5 kms/28 miles into the stage, so barring mishap, Cadel Evans will hold the polka-dot jersey tomorrow morning. For a number of years, you wouldn't have raised an argument saying Cadel Evans was Australian for ‘Levi Leipheimer.’ Like the Montanan, Evans could keep it close in the mountains and gain time in the time trials, but he seemed to lack panache, racing defensively with his head instead of his legs. The last few years, Evans has become a rider with some brio, winning the world championships with a perfectly timed attack in 2009, and taking Fleche Wallone and a powerful stage win at the Giro in 2010. On Tuesday, he again showed power and grit, climbing to a stage win ahead of Alberto Contador and Alexandre Vinokourov, and picking up time on most of his rivals for the overall win in this year's Tour. Jeremy Roy of FDJ spent another long day in a doomed break, today with Movistar's Imanol Erviti, Vacansoleil's Johnny Hoogerland, Euskaltel-Euskadi's Gorka Izagirre, and AG2R's Blel Kadri. The five escaped about 9 kilometers/5.5 miles into the stage, and were captured with about 4.5 kilometers/2.7 miles to the finish. Omega Pharma's Philippe Gilbert, the winner of Stage 1, was the pre-stage favorite to double up on his 29th birthday, and Omega Pharma did a lot of work to pull back the break and set Gilbert up for the climb of the Mur-de-Bretagne, but with less than 4k to the finish, BMC took over, with George Hincapie playing locomotive, as he has for hundreds of miles through the French countryside in July in 16 Tours. At 1.5 kilometers to the summit, Saxo Bank's Alberto Contador was the first to attack, followed by Gilbert and Evans. Thor Hushovd, holding the yellow jersey by a narrow second over Evans, battled onto the back of this high-octane group as rider after rider put on a burst to try to break clear for the win. Jurgen van den Broeck, Rigoberto Uran, and Gilbert all pressed attacks, but Contador and Evans matched them all, and Evans led in the final 100 meters as Contador quickly closed the gap. At the line, there was no telling who had won. Contador gave a celebratory fist pump, but the photo finish cameras showed it was Evans at the line by a tire's width. Evans had taken the stage, but Hushovd finished 6th in the same time, so the big Norwegian holds the leader's jersey for another day. While Evans's victory shows style and form, it also may signal that Evans thinks he'll have trouble in the high mountains, and needs to make time wherever he can from now until then. Contador, finishing alongside Evans, put at least a few seconds into everyone but Evans, and showed he's far from conceding, despite trailing by 1:42 after 4 stages. In the green jersey competition, Tyler Farrar took the intermediate sprint for 6th, picking up 10 points ahead of José Rojas, Borut Bozic, and Mark Cavendish, but the pure speed riders were shut out of the finish, where Philippe Gilbert and Thor Hushovd picked up 22 and 20 points, respectively, with high finishes. Here are the overall standings in the geen jersey competition so far. Cavendish seems bound to pop through for a stage win soon, but the Wenatchee Wonder looks fast enough to limit the damage from the Manx Missile this year. 3) Alexandre Vinokourov, Astana, s.t. 4) Rigoberto Uran, Sky, s.t. 5) Philippe Gilbert, Omega Pharma, s.t. 6) Thor Hushovd, Garmin, s.t. 7) Frank Schleck, Leopard, s.t. 8) Samuel Sanchez, Euskaltel-Euskadi, s.t. 9) Jurgen van den Broeck, Omega Pharma, s.t. 10) Andreas Klöden, Radio Shack, s.t. In the overall, there was a bit of a shakeup, as a number of riders lost a few seconds, including Andy Schleck, who was in a group of 28 riders eight seconds back. Today's 172.5-km stage is classified as a flat stage, but Mur-de-Bretagne translates to “Wall of Brittany,” so we'll finish with a quick, 2-kilometer climb of around 200 meters, which is the first 3rd-Category climb of the Tour. There's also another 1-point 4th-Category climb at the 79-kilometer mark. Just as we did Monday, we have a stage favorite with motivation from a national holiday. Today, that favorite is Philippe Gilbert, and the Belgian national holiday celebrated today is Philippe Gilbert's birthday. Gilbert is a heavy favorite to take a second victory in this very young Tour. Other stage favorites include Cadel Evans, who might be able to grab seconds and yellow with a high placing, Sammy Sanchez, or Damiano Cunego. The intermediate sprint comes 92.5 kilometers into the stage in Spézet. All 198 riders who started the Tour are expected to make the start. Thor Hushovd races in the yellow jersey, José Rojas in the green jersey, Gilbert in the polka-dots, and Geraint Thomas in the white jersey. Garmin's riders have been no stranger to the podium since the team debuted in the Tour in 2008, but the team has never taken the top step. Sunday, in a nail-biter team time trial in Les Essarts, Garmin-Cervelo got the monkey off their back, taking a 4-second stage win and putting world champion Thor Hushovd in yellow. Alberto Contador, the overall race favorite, saw his chances take another blow, as his Saxo Bank team lost time against many of his rivals, notably both Schlecks, Cadel Evans, Brad Wiggins, Robert Gesink, and Radio Shack's Four Horsemen of the Cyclopalypse, Andreas Klöden, Jani Brajkovic, Chris Horner and Levi Leipheimer. On the other hand, Cadel Evans again took advantage of a chance to make some time, leading his BMC squad to a smooth and surprising 2nd on the day, and missing the yellow jersey by just one second. Team Leopard-Trek had a rainbow-striped lion among its smaller cats, and world TT champion Fabian Cancellara looked strong enough to drag 4 men and their bikes to the finish. Leopard-Trek was 4th on the day, one of 3 teams (with BMC and Wiggins' Team Sky) to finish 4 seconds back of Garmin. HTC-High Road was just one further second off the win, likely on Bernhard Eisel's fall in the first turn that left them one rider down for the stage. Hushovd becomes the first Garmin rider in yellow. Even before the stage started, there was controversy, as the UCI decided to interpret its geometry regulations to mean that all riders had to race with their saddles level to the ground, apparently a change to how rules were enforced at the recent Tour de Suisse and Criterium du Dauphiné Libéré. Saxo Bank director Bradley McGee and Radio Shack director Johan Bruyneel were fined for “improper conduct” toward officials in the bike check area. Even recreational riders will notice a change to normal saddle position, and take some time to adjust to a new position. Today's Stage 2 features the team time trial. The TTT seems simple enough -- line up all your team's riders, and get them as quickly as possible to the finish line, with all riders who finish together getting the time of the 5th man across the line. In practice, winning the TTT requires strong riders, careful coordination, and a bit of strategy. Teams can't afford to drop their GC hopes, and will usually try to keep even their weaker TT riders in the group as long as possible by varying the length of their riders' pulls. Teams that are comfortable with the TTT will do this by smoothly rotating through a paceline, while teams that aren't will look like 9 guys on your local club ride. 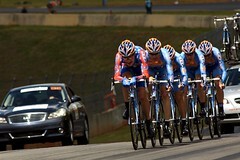 Strong riders will speed up as they pull through, causing gaps and extra effort for their teammates. The Tour itself seems to be minimizing the role of the time trial, and especially the team time trial. This year's edition is only 23 kilometers, down from 67 a few years back, limiting the potential damage. Alberto Contador's Saxo Bank team is first out of the blocks, at 8:30 Eastern, Garmin's at 9:26, Radio Shack at 10:29, HTC-High Road at 10:36, Leopard-Trek at 10:43, BMC at 10:50, and Omega Pharma at 10:57. The US-based teams tend to be strong in the discipline, and I've seen Radio Shack, HTC-High Road, and Garmin-Cervelo picked to take today's win. Personally, I'm expecting HTC-High Road, and rooting for Garmin-Cervelo. For a long time, Saturday's Stage 1 looked like a parade, with three drum majors leading the team floats on a quiet (if speedy) processional. Sure, there might have been a Shriner or two who tore their fez, but everyone would stay in line, there would be a quick performance for the stage win, and we would move on to the Stage 2 Team Time Trial for the first blows in the overall competition. Late in the stage, though, we discovered it was really the parade from Animal House, with Alberto Contador and Sammy Sanchez among the hapless ROTC cadets mowed down by 10,000 marbles, the early unveiling of Leopard-Trek's Fabian “Spartacus Deathmobile” Cancellara, and a swashbuckling appearance from Philippe “Sen. John Blutarsky” Gilbert. It was Jérémy Roy of FDJ, Perrig Quemeneur of Europcar, and Lieuwe Westra of Vacansoleil who built a gap that, at times, stretched out to more than 6:00, but were pulled back by long leading pulls by riders from Garmin-Cervelo, Omega Pharma-Lotto, and finally Quemeneur's own Europcar team. The first appearance of the mid-race intermediate sprint meant that American Tyler Farrar was the first true sprinter to score green jersey points ahead of Andre Greipel, with green jersey favorite Mark Cavendish putting his team on the front but not effectively competing in the sprint. After the leading trio were absorbed with about 19k in the stage, the pace remained high to the finish. With less than 9 kilometers to ride, an Astana rider trying to widen the narrow French road met up with a spectator trying to widen the quaint French roadside, and the resulting pileup left most of the GC contenders riding in a group of around 40. Caught behind were Alberto Contador, Sammy Sanchez, and Garmin-Cervelo all-rounders Ryder Hesjedal, Christian Vande Velde, and Tom Danielson. Radio Shack and BMC immediately moved to the front and lit the afterburners, but Contador's former DS, Radio Shack's Johan Bruyneel told reporters after the stage he didn't know Contador was gapped. A further crash inside of 3 kms to the line made a gumbo of the stage standings, with riders caught in the later crash given the time of the group they were with at the time, and riders caught in the earlier crash losing time picking through the later crash. Cancellara launched a fierce attack with about a kilometer to ride, but the favorite for the day, Omega Pharma's Philippe Gilbert followed the move he later said he had expected, and pulled away from Cancellara over the last 500 meters, with BMC's GC hope Cadel Evans closing the gap off the front of the field. At the line, Gilbert finally took his first Tour stage, Evans was second, showing he's brought great form to the race, and world champion Thor Hushovd of Garmin-Cervelo took third. In the end, Contador and Sanchez are 1:20 back on the Tour's very first day. That isn't so much for an unheralded rider, who might sneak into a break and make up a handful of minutes, but Contador is the overall favorite, and can't make a move without 10 very strong shadows. Unless Saxo Bank has an unbelievable team time trial tomorrow, Contador will have to make this time up in the mountains. Each year, I take a look at where the Tour's riders are from, with special attention to the traditionally English-speaking countries. Australia had 11 riders in the 2010 Tour, but returns to 2009's total of six this year. The addition of HTC-High Road's Matt Goss and Saxo Bank's Richie Porte means 7 Ausies who rode in 2010 aren't here: Adam Hansen, Brett Lancaster, Matt Lloyd, Robbie McEwen, Luke Roberts, Mick Rogers, and Wesley Sulzberger. Climbs from 8 to 10, with Armstrong retired, and the addition of Tejay Van Garderen and Tom Danielson, both in their first Tours, and Danny Pate, returning with HTC-High Road. Van Garderen, Farrar, and Bookwalter are the only Americans under 30 in the Tour. With Michael Barry out, Ryder Hesjedal is truly carrying the Weight of a Nation for Canada. Great Britain had eight riders last year, but 5 this year, with Cummings, Hunt, Daniel Lloyd, and Wegelius not here, but Ben Swift starting for Sky. Cavendish chases green, and Wiggins hopes to rebound from 2010 to go at least Top 10. Dean returns to lead out Hushovd and Farrar for Garmin-Cervelo. Again, Roche repeats as the only Irish rider. South Africa is again shut out, with Robbie Hunter watching from home. Shut out from last year are four countries that each brought one rider: Japan, Moldova, South Africa, and Sweden. I'm back again this year, trying to help people get the most out of the Tour de France on the web. This weblog got started by accident. I had posted a guide to the Tour on my personal weblog in 2003 (here's the 2009 version), and a couple of posts noting who had won the day's stage, or what was on tap for the next day's stage. One morning, I woke up and went into my office, and realized the drive on the (AMD K6-2 350) Linux box that served my weblog was really laboring. A few minutes later, I could see why the server was under load. Google's top result when you searched for "Tour de France update" was my weblog. I had been looking for a reason to try out the new hosted Moveable Type service at TypePad, so I spent about 45 minutes setting up a dedicated Tour weblog, and started publishing. In the 9 Tours since, the cycling landscape on the web has shifted tremendously for the better. In the early years, I was pointing out just about everything of any value about the Tour on the web. Today, that idea seems preposterous. The websites that existed then, like VeloNews and CyclingNews have expanded tremendously, and been joined by fan-driven sites like PodiumCafe and literally dozens of enthusiastic fan weblogs. Average fans can go out and make terrific photos and videos, then share them on Flickr and other sharing sites, and the growth of Twitter means it's easy to find like-minded fans and trade snark while the race progresses. So, this year, as in the last couple of years, I'll be very active on Twitter, and pointing out the best of the Tour de France web there and here on the weblog. The Tour rolls out today over the Passage du Gois, but with the risks controlled, as the Passage itself is neutralized. The stage itself winds along the French coast, then turns inland to finish at Mont des Alouettes. It's 191 km (119 miles), with a sting in the tail that's likely to leave Cavendish, Petacchi, Farrar et al. out of the running for the stage win. Look instead for a Classics-style rider, and none of them has had a season to match Philippe Gilbert this year, making him the day's favorite. With the first yellow jersey of the Tour on offer, Thor Hushovd, Matt Goss, or Fabian Cancellara could also take the stage. We may also get our first look at some teams' green jersey strategies. Organizers have changed the green jersey competition's rules, so the intermediate sprints, traditionally a non-factor in the competition, now are worth about half as much as a stage win. It's possible that we'll see competitors trying to wear the jersey by putting together a string of mid-stage placings.